Enter to win $500 below, or keep scrolling for contest details, terms, and conditions. Enter now, and don’t forget about the bonus entries! This prize is transferrable too, so you can gift it to someone else if you win. And you can win more than once – but not more than once every 3 months. Your whole family can play and win, so spread the word! 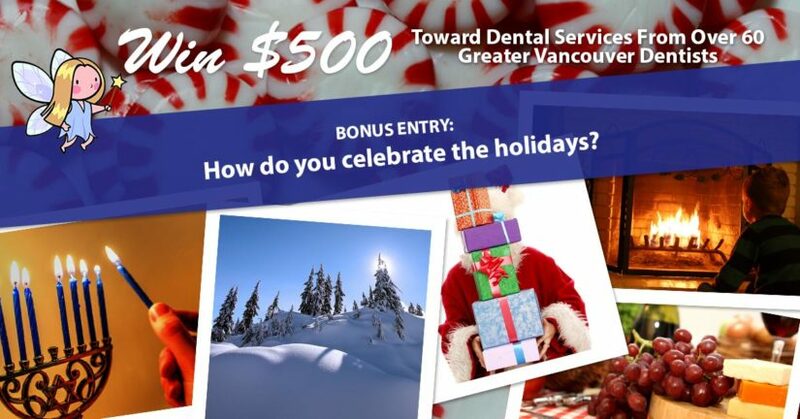 One lucky winner will receive a $500 gift certificate that is exchangeable for dental services valid at any of over 60 123 Dentist clinics across the lower mainland. See our list of clinics here. 1. Promotion Description: The ‘123 Dentist Monthly Giveaway’ (“Sweepstakes”) begins at approximately 4:00pm on the first day of every month and ends at 11:59pm on the last day of that month (Pacific Time (Canada)) (the “Promotion Period”). If either of those days is a holiday, the corresponding start or finish date may be postponed to the next regular business day. By participating in the Sweepstakes, each entrant unconditionally accepts and agrees to comply with and abide by these Official Rules and the decisions of 123 Dentist Ltd. (“Sponsor”), which shall be final and binding in all respects. Sponsor is responsible for the collection, submission or processing of Entries and the overall administration of the giveaway. Entrants should look solely to Sponsor with any questions, comments or problems related to the Sweepstakes. 2. Eligibility: Entry is open to legal residents of Lower Mainland, British Columbia who are 19 or older. Void where prohibited or restricted by law. Sponsor and their respective parents, subsidiaries, affiliates, distributors, retailers, sales representatives, advertising and promotion agencies and each of their respective officers, directors and employees (collectively, the “Promotion Entities”), and members of their immediate families and/or persons living in the same household as such persons, ARE eligible to enter the Sweepstakes and if selected, win a prize. 3. Winner Selection: The winner of the Sweepstakes will be selected by drawing from among all eligible Entries received throughout the Promotion Period. The drawing will be conducted within 48 hours by Sponsor or its designated representatives, whose decisions are final. Odds of winning will vary depending on the number of eligible Entries received. Winner will be notified by email at the email address provided in the Entry Information on or about 48 hours after the drawing and their name will be posted on the Sponsor’s Facebook page. Potential winner must accept a prize by Facebook private message or email as directed by Sponsor within 14 days of notification. Any winner notification not responded to or returned as undeliverable may result in prize forfeiture. The potential prize winner may be required to sign and return an affidavit of eligibility and release of liability, and a Publicity Release (collectively “the Prize Claim Documents”). No substitution or transfer of a prize is permitted except by Sponsor. 4. Prize Description & Details: The winner(s) will receive one (1) $500 123 Dentist Gift Certificate. This certificate is exchangeable for credit towards dental services at any participating 123 Dentist Member clinic in the lower mainland, including but not limited to Chilliwack and Whistler, BC. See www.123dentist.com for a full list of clinics. Certificate value expires 1 year from the date of the winner announcement, unless specifically extended in writing by the sponsor or its agents. Only one prize per person and per household will be awarded per 3 month period. The prize may be transferred ONCE as a gift, but ONLY when the winner contacts the sponsor to notify them of the transfer. Once the gift certificate is registered at a participating clinic, the prize is replaced with a credit for services at that clinic only, and that credit is non-transferrable. Restrictions, conditions, and limitations may apply. Sponsor reserves the right to not replace any lost or stolen prize items. However, the sponsor encourages the prize recipient to report any loss as soon as possible and recommends registering the prize with a participating clinic as soon as possible to avoid loss or theft. Prize will only be awarded and/or delivered to addresses within Lower Mainland, British Columbia. All federal, state and/or local taxes, fees, and surcharges are the sole responsibility of the prize winner. Failure to comply with the Official Rules will result in forfeiture of the prize. 5. Online Entry: Enter the Sweepstakes during the Promotion Period online by signing into the entry form and perform the tasks provided. The entry form can be found on the following website at https://www.facebook.com/123Dentist. 6. Registering Prizes: Prizes are awarded by the sponsor on behalf of dental clinics inside the 123 Dentist network in the lower mainland. The winner is obligated to provide certain information in order to claim their prize, including but not limited to a photograph of them smiling at least 1200 pixels wide, to be delivered with their confirmation and a lower mainland mailing address that matches photo ID. The winner will be encouraged by the sponsor to register the prize at a 123 Dentist clinic near their primary residents as early as possible. Once registered, prizes become as credit and may be accessed with no expiry date, at any time by anyone residing in the same residents or under the age of 19 years living elsewhere. Credit may also be accessed by children under the age of 25 with a valid student ID living at another residents, provided they can show proof of relations. 8. Limitation of Liability: Sponsor is not responsible for any incorrect or inaccurate information, whether caused by website users or by any of the equipment or programming associated with or utilized in the Sweepstakes or by any technical or human error, which may occur in the processing of submissions in the Sweepstakes. Sponsor assumes no responsibility for any misdirected or lost mail, or any error, omission, interruption, deletion, defect, delay of operation or transmission, communications line failure, theft or destruction or unauthorized access to, or alteration of, Entries. Sponsor is not responsible for any problems or technical malfunction of any telephone network or lines, computer online systems, servers or providers, computer equipment, software, failure of email or players on account of technical problems or traffic congestion on the Internet or at any website or combination thereof, including injury or damage to entrant’s or any other person’s computer related to or resulting from participating downloading materials in the Sweepstakes. If, for any reason, the Sweepstakes is not capable of running as planned, including infection by computer virus bugs, tampering, unauthorized intervention, fraud, technical failures, or any other causes beyond the control of Sponsor which corrupt or affect the administration, security, fairness, integrity or proper conduct of the Sweepstakes, then Sponsor reserves the right in its sole discretion to cancel, terminate, modify or suspend the Sweepstakes. In such event, Sponsor may, in its sole discretion, perform the drawing from among all eligible Entries received prior to or after such cancellation, suspension, or modification. 9. Winner’s List: To obtain a copy of any legally required winners list or a copy of the Official Rules, send the applicable request and a self-addresses, stamped, #10 envelope to 123 Dentist Ltd. cc: Facebook Fan of the Week at #211 – 2957 GLEN DR, COQUITLAM, BC, CANADA V3B 0B5. Request must be received no later than 48 hours + 6 MONTHS for the name of the winner and, by the end of the promotion, for a copy of the rules. 12. Facebook Disclaimer: Entrants should understand that they are providing their information to the Sponsor and not to Facebook. This promotion is in no way sponsored, endorsed or administered by, or associated with Facebook. 13. Prize Delivery: Winner must pick up the prize in-person at the offices of the agency organizing the giveaway in downtown Vancouver and provide identification to prove their identity – OR – the winner must provide a working email address to receive the digital certificate – OR – the winner must provide their mailing address so that the prize can be mailed, in which event, 123 Dentist and its agents accept no responsibility for the delivery or non-delivery of the prize to the winner’s address if the winner elects this delivery method.